I found this Great Graphic on Thomson Reuters. 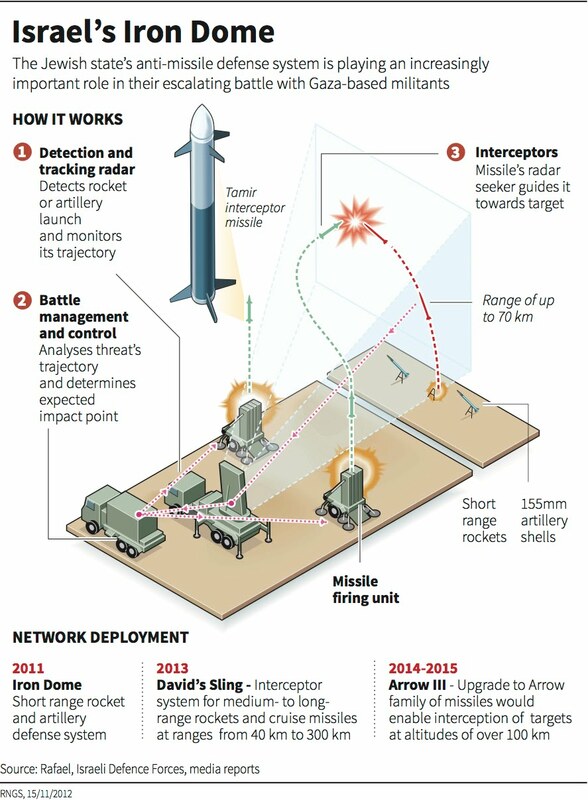 It illustrates how the Israel's "Iron Dome" works and how it is planned to evolve in the coming year. Reports suggest that it has had a 90% hit rate on incoming missiles. While futurists talk about the competition for a low-carbon economy or a post-automobile transportation system, there is also a competition for a missile defense and Israel has solidified its lead. During the Cold War, until Reagan, there was little development of missile defenses. The idea being that a missile defense negated or weakened "second strike" --retaliatory capability--which was the basis of MAD (mutually assured destruction). This "second strike" capability acted as a significant deterrent. Israel's deterrent has been a casualty of the skirmishes in recent years. 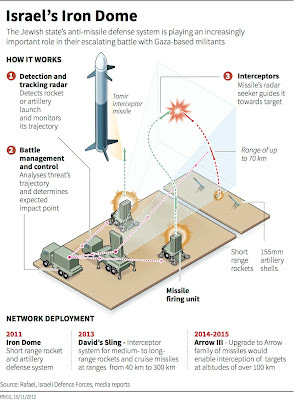 The Iron Dome and Israel's current actions seem to be aimed, at least in part, to re-establish deterrence. A truce, if not under proper terms, will allow new stockpiling of missiles and more powerful ones at that. A cease fire for new negotiations is one thing, but reports suggest Israel has dropped leaflets urging Gazans to prepare for a ground invasion and leave homes. The Israeli shekel depreciated by about 5.2% against the dollar from mid-October through mid-November. It has appreciated by 2% over the past four days. The dollar is testing the ILS3.90 support area. the ILS3.8850 area corresponds to a 50%, which is just above the 200-day moving average (~ILS3.8750).